Now with SiRFstar4 technology! 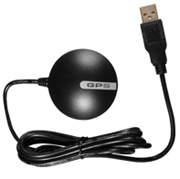 The BR-353-S4 GPS Receiver can be utilized in a variety of applications which require GPS signals to be received and decoded in your Windows laptop or tablet PC, and for Mac users, their iBooks or Powerbooks. Compatible with most all NMEA compliant third-party software, the BR-353-S4 is suitable for use in vehicle, marine and aviation navigation, as well as commercial and municipality applications such as fire trucks, police cars, buses, GIS data collection and much more! The BR-353's slim profile housing is completely waterproof and incorporates an active patch antenna for the highest level of GPS accuracy. The unit is equipped with a USB connection. Placement of the GPS receiver anywhere within the vehicle will usually get sufficient GPS signal reception, but in those rare occurrences when towering high-rises offer challenging satellite reception, simply place the BR-353 on the vehicle's roof (attaches with its built-in magnet) for improved reception. Power is transferred through your PC's USB port. Data is also transmitted to the USB port.